I was humored this week with the “scary” interview that the state-controlled media put out on terror suspect Christopher Cornell, also known as Raheel Mahrus Ubaydah. He said the terrorists were in Texas, Ohio, New York City and Washington D.C. His message was that they are in your country and in your state, ready to wage jihad on American soil. Really? Well, how couldn’t they be when they have an administration helping them along at every step of the way, pulling down all security on the borders, as well as opening up the flood gates to illegal aliens on the American people? Additionally, the administration has been appointing America’s sworn enemies to high positions in our government and its agencies (Deuteronomy 28:49). “Then I would have released more bullets on the Senate and the House of Representative members, and I would have attacked the Israeli embassy and various other buildings full of kafir [non-Muslims] who want to wage war against us Muslims and shed our blood,” he added. Outside of the fact that this kid sounded like he had some mental disorders, I could do nothing but see the diversion that is being played out on the American people who refuse to take heed to the Word of God, which is so prophetically right on. As a side note, at this point this would suicide mission for these jihadists, for they know that behind every blade of grass in this country is an armed citizen. 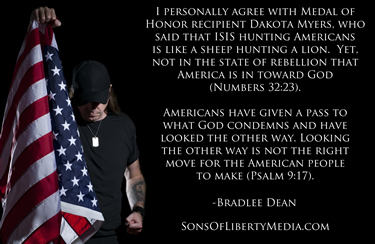 I personally agree with Medal of Honor recipient Dakota Myers, who said that ISIS hunting Americans is like a sheep hunting a lion. Yet, not in the state of rebellion that America is in toward God (Numbers 32:23). Americans have given a pass to what God condemns and have looked the other way. Looking the other way is not the right move for the American people to make (Psalm 9:17). We can clearly see that America is under the judgments that God has promised to a rebellious people. Nothing else besides the judgment of God can explain why the American people have let it go this far. Why would he want to bring harm to this president? This criminal has done nothing but bring aid to this jihadist both here, via the Muslim brotherhood and their terrorist ties, and abroad. Is this an attempt to bring about more fear and diversion so the Americans get their eye off of who the real enemies are? • Who has attacked and transgressed the American Constitution, lied, and been engaged in cronyism in over 900 documented accounts? • Who has attacked America’s Christian heritage more than this administration? • Who has appointed several terrorist-tied Muslim brotherhood members to the Department of Homeland Security? • Whose Homeland Security Secretary recently stated that it is his job to “Give voice to the plight of Muslims”? Yet, Americans have been told for 14 years that they were under attack by the Muslim jihadists; the very ones who are now being promoted and defended. • Who appointed the stooge John Brennan to the head of the CIA, who converted to Islam in Saudi Arabia years ago? • Who has given millions in financial aid to the Muslim brotherhood, even arming them with American F-16s? • Who is releasing more GITMO detainees that are returning to war against the American people? • Who said that they would defend Muslim Jihadists if they were attacked? • Furthermore, who is attempting to disarm the American people through its lying and scheming ways? While I believe Cornell when he says the stage is being set for more attacks, I ask you, the reader, who has set that stage more than the American people allotting this administration to transgress the law as it has? What else do you expect? This is nothing new. Read the Declaration of Independence and you will find the usurpations of a tyrant that would not be ruled by God. You will also find the degree that these wicked men will go to in order to make sure they remain in power. Don’t be deceived (Galatians 6:7). Men Do Not Follow Titles, They follow Courage! Are You One Of Them? Who supports this Administration Anyways? By the way, did anyone catch what the incompetent, home-grown jihadist said? “I would have took my gun, I would have put it to Obama’s head and I would have pulled the trigger.” Why would he want to bring harm to this president?